The period right before the end of the semester can be an especially stressful time for graduate students as they prepare for final exams, papers and presentations. De-Stress for Success provides an outlet for students to practice self-care and wellness in a fun and relaxing environment. 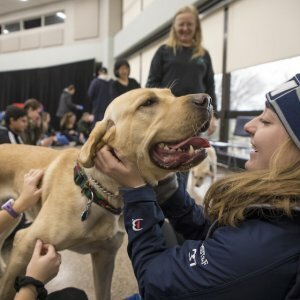 De-Stress for Success activities include therapy dogs, coloring, chair massages, free refreshments, and much, much more! This event is hosted by the Office of Graduate Studies as part of Graduate Student Appreciation Days 2019.